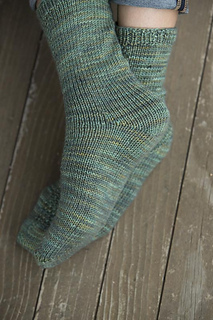 These socks are worked by casting on at one cuff, and the first sock is completed cuff-down with a no-wrap short-row heel. The toe is shaped before working scrap yarn (to be removed later). Rejoin yarn and begin second sock starting at the toe. 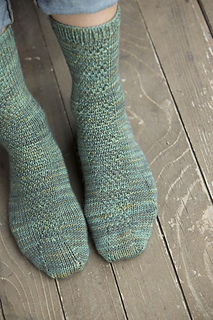 It is completed toe-up with a no-wrap short-row heel. Remove scrap yarn and graft toes closed. 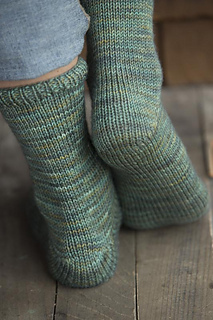 For men’s US sizes 8.5-10 socks, add .5” length to the leg and foot when knitting the women’s US sizes 6-9. For men’s US sizes 10.5-12, add .5” length to the leg and foot when knitting the women’s US sizes 8-11.